Pay What Feels Good from $10-$25. What a lovely website ;-). It has really inspired me especially the part with your dog and the healthy food ;-). I have just completed yoga teacher training and want to start my business and was looking around online what to put on my website/blog. Now I know, got plenty ideas…thanks to your blog ;-). So glad to hear it. My blog is just getting started too! I look forward to what is to come while doing my best to really enjoy the present moment! Lets continue to inspire each other! When you get your site up be sure to share it with me! Good luck to you and Namaste! I started your 31-day Revolution on the first of the year, then went through 30 days of yoga, then yoga camp, and back to the beginning again! What a life changer! So happy and grateful I found your videos! My only regret is that, no matter where I have signed up (and I have signed up wherever there has been an option to do so), I have never received any of the emails you sometimes refer to. I get something from Bloglovin’ every once in a while, but it is never from you (or about you). Add me to the list of folks who want you to be a best friend –and I am in my 60s! I was looking for yoga and God sent me an angel you. What a lovely lady, and a gentle but great teacher. Thank you from the bottom of my heart. Which resides in Pretoria South Africa. I was wondering – are there still spots available for the Nicaragua yoga retreat in June and if so, how can I book? Hi Adriene – I couldnt’ figure out how to post my own comment so I’m piggy backing. I’m loving my 31 days and doing my best to practice (almost) daily. I’m a fit but not so flexible 62 year old woman who sits many hours in a psychotherapist chair and I feel it. Yoga does the trick! But I saw something about you being in NYC this week. What’s up, where?! I live in NY and would take a class with you in a heartbeat! Hi there Deric! You can reach me at [email protected]. Hope to hear from you! Sounds awesome! I’m much more personal than using an email addy to communicate, so if this your means of communication, no thanks, but thanks. Perhaps you can rethink how you use your email. If you change your perspective about how personal an email can be, then perhaps such an opportunity could add more goodness in your work and life. I agree Genevieve. What a helpful and supportive response. How rude. Why would she give you her number? Why would she indeed. Presumptuous, wasn’t he. Love you Adriene! You the only source I reliably and regularly turn to in Southern Cal, not for lack of options, but because there is NO ONE like you!!! Keep it up, you are a YogiStar!!! Adriene! I’ve been watching your videos on YouTube for quite some time now; I follow along at home and you’ve truly been an inspiration to me to begin my journey into yoga. After having major knee surgery I couldn’t run or walk so I took on Yoga as something to rehabilitate my injury and to achieve the range of motion I once had, and now I can’t stop. The feeling of utmost joy radiates from me with every movement and I am so happy after the session. I live in San Antonio and I travel to Austin a lot and plan to move there once I graduate; I simply love the city. I hope to attend one of your classes in the near future and meet you in person! Thanks for everything! Alex! Hello and thank you for this sweet message! I wish you the best and hope that you do come drop in and say hello when you are in Austin!!! Namaste! I love your website and videos! I had a baby two years ago and since I got a c-section my belly looks awful. I have no core muscles and it is slightly swollen still 🙁 Can you recommend some good yoga poses to tighten and strengthen my core? I love you website and your practice. Huge inspiration! I am coming to Austin at the end of March and I can’t wait to take class with you! This is my brighter highlight of my Austin trip! Hello, Adriene, I just watched (and followed along with) two of your yoga videos and really enjoyed your style. I have recently turned over to a “body-mind-soul” health initiative after a rough 2013 and have been trying to incorporate yoga into that… it clearly touches all three of those above things. I look forward to watching more videos. I am in Tucson, AZ so I will be a virtual student. I’ve never done yoga before and wanted to try it out…so this weekend I found your beginners vid on YouTube and it was great. Thank you for putting it up there. Please continue writing such nifty information, I like such type of ideas! I adore how the info is nicely written, and the focus on the specifics. Any yoga classes tonight??? in town on business but would be interested in joining if at all possible. I just found your youtube channel & realized I’m not far from the SVT. Is it a full house or can I come next Tuesday? I really love the way you instruct us to make yoga. I started yoga couple of weeks ago and you are amazing. Yet I have 3 questions. 1. I love to have 6pack abs or atleast fat abs. I am strict on diet and exercise. No junk foods yet can get rid of belly fat. rest of my body is good. 2. when I try to touch feet with hands and forehead to knees in an asana. My body is not able to bend totally. How long it takes and how to do it. 3. I want to do a scale position which you did in one of your pictures. total 180 degree stretch of legs. I can’t do that. How to do it. Finally I am from Australia so I can’t come and do classes with you in person what is the order to follow your videos to get good health and shape. I am Amy from NYC, a big fan of yours… i have been using your yoga videos everyday and LOVE them! Just want to send my xmas card to you and your team who help building this amazing site to share for yoga lovers like me. I am also a dog lover 2 dogs monkey (affenphincher) nacho (brussels griffon)… i draw xmas cards with them in it every year, reminds me of the beautiful card your fan drew for your doggie. So I would like to share mine with you, and i would like to get your office address to mail my xmas card to you. have a wonderful holiday and thank you soo sooo much for this amazing site, sharing so much amazing classes and you won’t even believe how much i have gained from doing yoga with you everyday. Thank you for this and I wish you the best year to come. Live in the UK and do your videos. You have a wonderful style – so calming, so full of fun and yet encouraging. Many thanks! I’m really enjoying your 30 day challenge! I love how you sequence the poses- it has helped a beginner like me learn the poses and really challenge myself to push beyond the edge. I look forward to more of your videos! I just wanted to say Thank you for the 30 day challenge. I’m on day 18!! !Since Ive started things in my life, hard decisions ect., have become more clear. I still have a long ways to go but I just wanted to say I really appreciate what you do. Keep up the good work!!!!! So, I am going to be in Austin this weekend and it would be amazing to attend the Saturday class. Could anyone help me out? Is there anywhere I need to reserve or sign up to be in the class? Is there a limited number for the Saturday class. I would just really like to attend and I’m not sure if there is some attendance protocol! Thanks! Hi! I found your videos on you tube, and thanks to them, and you, I now do yoga regularly. I’m still learning, but you make it fun! You’re a funny lady, and I find myself laughing a lot during the practice. This makes it feel more light and not so serious. I’ve tried in the past and it always felt so strict and stale. Keep up the good work, and I can’t wait to see if I can order one of your T shirts! Good Morning A!!! Did you Power Yoga video— loved loved it . The 30 day YC is next. Thank You Thank you!!!! THANK YOU love, love, love you! Planned on a quick trip from Boston to Austin next week for the 23rd and 24th and hoping to catch a class – but looks like I won’t get the privilege! Any chance there is a class I can attend you recommend? Thank you so much for what you do – you are a super star – also you have a lovely calming voice which is so nice. Hey there! I’m coming back to the mat (after 3 years of not doing it) thanks to your awesome videos! I wish I was in the US for taking a class with you. I left a comment but lost it! So I am not sure if you saw it and responded! Thank you SO much for being you and doing everything you do! I am visiting Austin (FOR THE FIRST TIME :DDD) from Portland, Oregon on July 21 which is a Tuesday and I am really hoping to make it to your class! Do you know if you will be in Austin then? Is there anything else I should know about reserving a spot? Hi! I just wanted to take a moment to thank you for what you do. Through youtube you’ve become such a big influence in my life, definitely for the better. I am happier and more empathetic and generally just in a better place. It sounds weird but I feel like you’ve come to be a wonderful friend. So thank you! You’re awesome – please, keep doin what you do! This is the second week that I been practicing Yoga and all I can say is that I love it!!! Your website is completely awesome 🙂 the beginner videos are great I believe I am doing better than what I thought I would do since this is my first time trying Yoga. I am planning on coming to Austin and attending one of your Saturday classes. I’ve been loving (and sharing with my students) your youtube clips for a long time now. It looks like I may actually get to experience a class in person this summer. I’ll be in SA for the first two weeks of June and hope to drive up to Austin to do some touristy things and drop in on a class. Do you have your June schedule yet? Hi Adriene! I have been practicing yoga for about 9 months now and was happy to find your channel. Sometimes I go to classes at my YMCA and sometimes I do home yoga (or hoga as I like to call it) but either way I’m in love with it and love the progress I’ve made–so thanks for being a part of it. I currently live in the ATL but will be in TX at the end of June/beginning of July to see my sister in Houston. When my boyfriend asked what I want to do in TX my number one request was “do yoga with Adriene” so he’s trying to make that happen for me. Loooong story short, do you anticipate that the schedules listed above will change all that much come summer? Hi Monday at Practice Yoga and Tues and Sat at SVT will remain! YAY!!!!!!!! Will you be at the Blanton in June? How long are the classes? This is Mariska from Amsterdam, the Netherlands. I’ve just started on your 30 days of Yoga course and I love it! I tell everyone I know about it and every day I look forward to a new lesson! Sometimes I even take 2 classes a day, 1 in the morning and 1 in the evening. Or I do 2 lessons in a row.. Please let me know. And thank you for giving me this opportunity to practice yoga from my home! Hi! I am going to be in Austin this Wednesday- Friday, June 17-19. Are you teaching any classes that I can attend. I’m from Ohio and practice with your online classes all the time with friends from work and would love to make it to a class! World is celebrating yoga as International Yoga day on 21st June every year. I belongs to Indian and now feeling proud that Yoga was originated from my country. Tanks for giving me my first Yoga experience in such a energetic and joyfull way. I am totally hooked on your 30 Days program now – just finished day no 3 and are looking foreward for no 4 tomorrow. Hi Adriene, My name is Gianluca and I’m italian. One year ago It happened to me to met one special person that inspired me to start yoga. It also recently happened to me to bump into your “30 Days of Yoga lessons” on You Tube, which ones I really enjoy to do (Today I’m at the 13th lesson). I also have to add that this person lives in Austin and I’ll come to met her in August. Last happening, yesterday I realized that you too live in Austin (!) and me and this girl would like to take part at one of your classes in August, while I’ll be there. Is it possible? Are you going to give classes in August? If yes, which one you would you suggest us? Loving the YouTube vids here in Australia and sharing them with both my female and male mates. Would love to download the full version but wary of credit card scams. Do you know if the https://30daysofyoga.vhx.tv/ website is legit to share those details and purchase your set of 30 vids? Big smiles from sunny Oz. Maybe silly, but I think it will make you feel awesome to know that in my city you have some true fans!! My fiend and me being doing your videos for a month now, and we absolutelly love them!! I think, (and believe me, I’ve been searching) you are one of the best yoga teachers on you tube right now! One think I love about taking classes with you, is that I´m eager to wake up tomorrow an do my yoga!! Hi Adriene. Was just wondering if you could do a yoga video with poses that are good for vocal health, the throat chakra etc? or even just let me know which poses really help in this area. So my birthday is next month on the 7th and I wanted to come down from Houston for the weekend after and take a class, is that possible? you’re great gal! Just wanted to get that out! I’m from Switzerland and enjoying your contributions immensly. Right now I’m on my Sabbatical and having a great time traveling and discover new things. I also will stop by in Austin (kind of inspired by you but also have a cousin in Tuscon…) Are you teaching in Austin first week of October? Would be great to meet you in person!! Your videos are really great. I have been practicing yoga for the past 4-5 years on and off. I really like how you engage the posture to its full potential rather than quickly going through the movements. I think this helps deepen the intensity of each strength. I think will be a regular subscriber to your videos. As a psychiatrist and a first generation Indian-American, I think that yoga and meditation is such an important foundation of our existence. I highly recommend it to each one of my patients, as I think its a great combination of strength/balance/flexibility, last but not least breathing/mindfulness. Keep up the great work! Two quick questions: What is a good way to make sure my form is correct while watching videos? What should I do if I get behind in the video (or the video gets ahead of me)? Come to San Francisco and do some classes! I’m from London, UK and am roadtripping from LA to Texas over Christmas! I’m planning on stopping in Austin to come to one of your classes- will these dates be rolling over Christmas or are you taking a break? Thank you for your yumminess and for you being you. I love your wild imagination. I would love to learn how you became a yoga instructor and the training you went through. I love yoga and would like to be trained! I’ve just begun my journey into Yoga a few weeks ago. 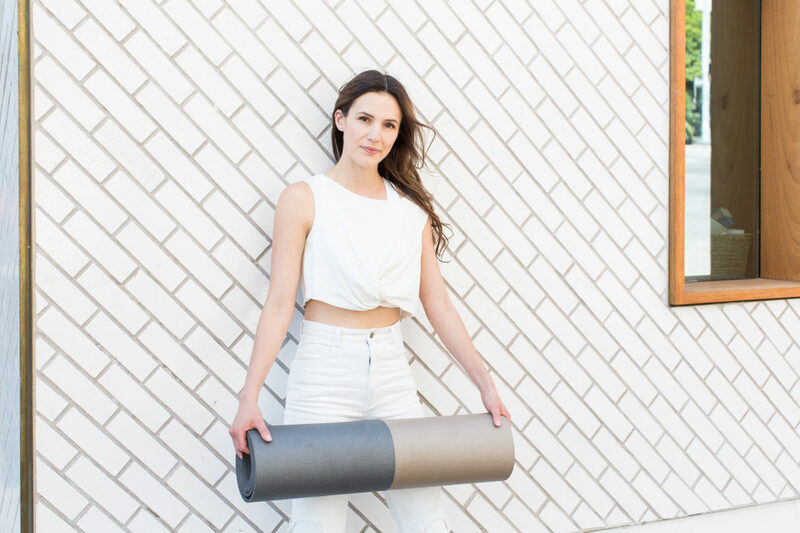 Your videos have really inspired me….I felt like I was already on a path but now being able to focus on bringing my mind and body together has brought new energy to me. Thank you! Curios if you have a recommendation on where to go to become Yoga Certified. Thanks again for your energy! Thank you for all the work you put in to your craft, you inspire me and many others with what you do. The positive energy I get from you through my computer screen can keep me going all day, so again, thank you. I was wondering if you have any plans to come to LA any time soon? There is a yoga expo on January 3, will you happen to be there? Adriene, thank you so much for guiding me through my yoga journey. I’ve been doing your videos for a couple of years. I have been practicing on an off for a long time, but your videos are just the best! You have such a lovely energy and playful spirit, and that’s what kept me going. Thank you again!!!! Hi Adriene! I am a fan of your YouTube channel! I live in Delaware and my husband and I are getting ready to embark on a year long RVing trip across the country with our 3 young kids. We plan to be in Austin for a couple weeks around Feb-March and I am excited to see you teach around town. I can’t wait to come take a yoga class with you! Do you teach anywhere that allows kids? They love your YouTube channel, too. Thanks! i also want to thank u for your videos and let u now, that u even inspired me in germany to start with yoga-practice :-). Happy new year! Hi Adriene- I started doing yoga via youtube videos. I found your gentle yoga video and have been doing that about once a week, I started doing more yoga on days when my energy was low and i had a hard time making it to the gym. This way i can still get exercise. Thank you for your gentle and easy to use approach. I have been doing the GY videos because it is easy to do, and i keep learning even though I have done it before. I really like your “from the ground up” approach. It is very common sense oriented. Just wondering if you could recommend any mindful/yoga retreats? I am looking for a short retreat somewhere outside of the UK over Summer. I’m a student and feel like I need to get away but I’m on a budget and will be going alone. Just wondering if you’ve had any particularly good experiences or places in particular that are good? Thanks so much for getting me into yoga via youtube! I love this giveaway and I love you blog. Love that you are in the UK. I have found some wonderful quilt shops by reading your poot.sHspe that I win but if I don't then I hope the person who does can spend many hours sewing to their hearts content this summer. Hi Adriene! Sis-in-law & I just started doing yoga with your videos! We found you to be just righ for us! We feel that that it’s as if you’re speaking to us personally. Doing a great job, keep it up! And so will we! My best friend and I LOVE your classes and have been talking about taking a trip to Austin to take a class with you (we live in Boston). I saw in your email today that you were teaching in NY this weekend. Is there somewhere that you post when you are teaching outside of Austin? We would love to know ahead of time when you are teaching closer to Boston so we can take one of your classes. Hello friend 🙂 I know it may be a bit early to inquire but my best friend and I will be in Austin in March and would be incredibly honored to attend one of your classes. Do you know what your schedule might be the week of the 22nd to the 26th? Hope you have a lovely Valentines Day. I love your website coaching and approach, and have been sending your link to everyone and anyone for months! And I am planning on heading to Austin in March for SX! Are you teaching any yoga classes March 10-13 or so that I might come to and see you for an in person class?! Still figuring out the trip, housing etc, but that would be such a treat! A friend introduced me to yoga just before new year… and now I am at the 22 nd day of your 30 day challenge. Thanks for all the effort you made making them… finding a class is a challenge (work is irregular) but thanks to your videos. Thanks also for theclear explanation and helpful encouragements and relaxed way regarding what a beginner can do… making me feel ok with the things I can’t yet. Just a quick thanks for your yoga offerings. My students often ask me for resources to practice at home and I am always happy to recommend your gentle classes as I think they are simply perfect and reflect a thoughtful and safe way for my students to honour their bodies and continue to practice when they can’t make it to class! I am really wanting to make my abs look a lot better for summer this year. Do you have any yoga poses or videos that could help with that? I really appreciate your work and I like very much practicing yoga following your videos which I found incredibly inspiring. Thank you very much for all your work! I’m also writing you to ask an advice: I’m suffering since a few months of a herniated lumbar disc. Doctors told me that I could take graeat advantages from streching and yoga. Could you please tell me if there are some videos among yours that you would recomand in cases like mine? I hope you will answer me, it is very important. I had a question about your classes in Austin. Could I get an email address so that I can email you some specific questions? Thank you for this, I watch your youtube videos and it’s helped me a lot. I wish you every success in life. Just wanted to say that I love practicing with you through your videos. Your practice connects with me much better than live classes in my hometown, I always end your sessions feeling significantly better than when I started and *confession* I often cry at savasana which never, ever happens with other videos or classes. Thank you for sharing your yoga practice and with us. Hope to make it to a live class one day. I live in Detroit, and I absolutely love love your yoga practice online, thank you for sharing. They help me so much, because sometimes there is just not enough time in the day to go to the gym. I just wanted to thank you and let you know you’re doing an amazing job! I definitely want to join a live class one day, or like I saw above, a live tour would be great! I’ve been following your videos for several months and I really enjoy practizing yoga with you! Just wanted to say THANK YOU for sharing!!! I have been diagnosed with anxiety (like at least 6 episodes a day, bad kind), am a board certified massage therapist, and I am also not very flexible. So I really needed to start yoga. My first video was your anxiety video on youtube and I am now hooked! Thank you for doing this for free and doing it with humor. I think that was what made me want to continue with yoga. I was wondering though, do you have any specific tips for someone like me? I signed up for your weekly e-mails already, but I thought maybe you had more tips than you usually give out. My e-mail is [email protected]. Thankss again! I was just wondering if you ever come out to Houston to teach yoga? I’d be there in a second! Until then, I will just see you thru my computer every week! I have done some of your yoga videos on You tube off and on and have just this week started your Yoga Camp, have completed 5 days thus far. LOVE IT! I have back issues so it helps me tremendously!! I live in an isolated “yoga desert” in the Panhandle and was despairing about how I’d maintain my practice (and my sanity). Then I found your awesome videos. THANK YOU for sharing and for being here. A friend told me about Thirty Days and I am loving it. I am fairly fit (at 62) and I love yoga, but had lapsed and was SO bored with the gym routine. There are lots of classes here and there where I live (Napa Valley), but I absolutely love the way you teach and that I can do it in my home and around my varying art studio hours. I am only up to Class 12 … mostly because I repeat some of my favorite days….but I already feel myself getting stronger and more flexible. You are simply, the best! Many thanks! Love your work! Fun & Inspirational. Hi Adriene – Just wondering if you are holding any practices over Labor Day weekend as I will be in Austin! Love your classes online, but know that they would be magical in person. I’m a huge fan! I follow you on YouTube and just love your morning and bed time yoga. As someone who finds it difficult to sleep it’s so helpful! Hi There Adriene, I am from South Africa, my boyfriend and I just started our yoga journey. We follow your videos everyday and we are really loving it. Thank you for the inspirational yoga videos. I have recently broken my coccyx and i have found that your yoga videos help relief the pain. Thank you so much for everything you do! I’ve been a huge fan of your yoga videos for several months now. Yoga has really helped me reconnect to my body and my own strength and power. Recently, my neurologist told me yoga is not a great idea for migraine sufferers like myself because downward dog and other inverted poses can trigger migraines. I’m wondering if you have any videos with fewer inverted poses so I can continue to practice? I am 15 years old and I live in the UK and I took up yoga (at home) about 2 years ago. I recently had a break away from it so i am not as flexible as I was but I am now looking to improve my mind with yoga and not just my body. For instance the first time I ever took a yoga class, I got this feeling which I cant explain in any other way except it was full of euphoria! I was just wondering which videos of yours you would suggest as I have done a few and they are incredible! Your videos have brought back my confident self and of course a better posture! You have really helped me in general life even though I have never seen you in person, and for that I am truly grateful. Thank you so much for sharing your gift with everyone! You are an amazing teacher. Your personality shines through your videos and I am a big fan of your sense of humor! I appreciate the time and dedication to you give to your followers and the love you put into your videos. I don’t know that I have ever felt better and more free to be who I am. Thank you Adriene! Do you plan on visiting Switzerland, Germany or Austria somewhen more or less soon for giving classes? That would be awesome. Please let me know! I’ve only just seen that you’ll be in London next week and I’d love to come to one of your classes. I know it says both days are sold out, but is there any chance you might have space for one more please? Finally I’m writing to you after a long time I wanted to thank you for your videos and support through the screen of my laptop. After moving to The Netherlands 3 years ago from my native Mexico, I faced a lot of personal challenges, from the cultural shock to the weather and working culture. A few months ago I suffer what is called a burn out from work because of the amount of stress and lack of self awareness I let my self be dragged to. I decided I was going back to my life, great, happy and with purpose. After founding your videos and following 30 days of yoga and 30 days yoga camp and letting myself be jealous of my me-time. Yoga with Adriene has bring me confidence to give mobility and do things with my body that I never thought I’d be capable of. I have never been sporty and I’m stiff as a table but I’m having fun finding what feels good and challenging myself for more. Thanks for the bottom of my heart you have been key to my rehabilitation to my inner happiness. Brenda, I feel the same way! I moved from Australia to Mexico (we have kind of done a swap you from Mexico to a British Colony and me the opposite 🙂 And it’s hard huh!! These videos and this attitude has saved me on days. It’s the best! I’m Calvin from Canada. I’ve been watching your yoga videos for a year now and I just want to give you kudos for sharing the knowledge and love to the world community. Not only are you knowledgeable about yoga, but you’re sincerity and realness is what sets you apart from other instructors I have watched. Keep up the amazing work, it’s not just about yoga for the body but it is the energy and positive rhetoric you put forth that is truly profound in changing lives for those who watch and listen and channel your energy directly or indirectly with others :)! Thank you so much for all your videos, I have been doing 30 day yoga camp every day. You are a wonderful teacher with a great sense of humor. Practicing yoga with you is helping me in so many ways, I am very grateful for you and finding your classes on YouTube. Maybe one day you will teach in San Diego and I can join your class in person, that would awesome! This is Aileen from Hong Kong. I would like to say a big thank you for your online videos. I am a beginner in Yoga practice. As I don’t have time to travel and go to public class, your videos help me a lot. I am now starting with the foundation of Yoga, and wish I could do them correctly. Then I can move on to some sequence / flow. I’m Laura, an Australian who has recently moved to Mexico City… where Hola is about all I can say, and I know about 4 people in the whole country… that is one of the reasons why having a daily yoga practice with your videos, and now your 30 days of yoga has been so precious. Strangely your voice has become one of the most familiar for me! Weird how the internet works huh? I am planning a trip through the states in December and I just wanted to confirm that you will be taking your class in Austin on December 17th? I will make a special trip to ‘find what feels good’ with you IRL. Either way, thank you for the familiar voice, the videos, the new found strength and flexibility (and some days sanity) I have found in your videos. Thank you again for the videos– they keep me grounded! I am so in love with the community you have created with YWA, and am so grateful to be a part of it! I was wondering if you will be teaching in Austin around the Holiday season? I am headed down to Austin to visit with my fiance’s family and would love to be able to take an in-person yoga class! I will be in Austin visiting my sister in March for a couple days. Hoping we can some how make it in time for me to attend your Saturday class! so i wanted to attend your class. but when you came to England i went to California hugging big trees and stuff like that, nice place by the way. . Is there going to be another in Europe soon . will travel but Austin a bit far if you do England again i think you should try and book Alexandra palace it is massive as Im sure when you come back your following is going to be mahusive . I’ve always had problems with transitioning to down dog/plank to lunge. I cannot get my foot up in one move. Are my arms too short? My belly too poofy? Lol. I’m in the UK and following Yoga Revolution. After day 21, I was inspired to put a comment on my facebook page and spread the word. Lots of my friend are now doing it and they have told their friends. Some had already found you. I had a stomach injury a few years ago so with scarring its mis-shapen, however with your yoga, for the first time it is changing shape to look like a stomach, wow, after 3 weeks. You are inspirational, and a gift. I finally committed to following your 31 days of yoga practice you recently published on YT. I am feeling the results quite immediately, even though it will be a gradual process and I’m only on Day 5 (yes late start). You really talk through your videos so well that anybody can follow at any level. I even managed to do your workouts while I was sick, at least a low-level one for back pain, but I didn’t want to forego a workout. Thank you and I look forward to learning so much more from them. I hope to catch you on your visit to Los Angeles in a few months. Delighted I found your videos. I have been practicing with you through your youtube videos for a couple years now. Might sound weird, but I feel like we are friends LOL. Anyways, thank you for being you and for teaching and being so open minded and great. I currently work in the substance abuse field and I am in recovery myself and yoga has transformed my life and opened my mind, body, and spirit in ways I know I couldn’t have done on my own. Furthermore, I was wondering if you had any input on any yoga schools to become a yoga instructor in Pennsylvania? I don’t really want to just jump at the first place I see and I don’t know anybody really off the top of my head that would have any guidance on that topic. Before I go, just want to say THANK YOU for your inspiration (for reeeall). I don’t normally do this, not one to comment on blogs etc but I just wanted you to know what a positive effect practising with you has had on me. I have always tended towards perfection and found dissatisfaction and disappointment if things/people/myself fell short of this. This year I decided to challenge myself to change this and find ease and enjoyment if I could. Practising with you nearly every day from the start of this year has not only found me feeling stronger physically but feeling less stressed and lighter mentally. I just want to say thank you for making your yoga practise so light heated, enjoyable and self motivating. I never regret coming to my mat and hope to continue to bring yoga into my life with you as a guide!! Hi Adriene – love you so much! Been an online “fan” for a few years now, and you are just the best. Thank you! I have just completed your Revolution series for the second time. I have an advanced back condition called spondylolisthesis, and after the first month of Revolution I was feeling such significant pain reduction and sleeping so much better with so much less pain that I repeated your series. The series has been so inspiring to me that I’m considering yoga teacher training and pursuing yoga therapy to help others with my back condition. I would love to know what kind of yoga you have specialized in and if you know of any teacher training similar to yours that I could pursue in the Grand Rapids, Michigan area? Thank you for your work and inspiration! For many years I’ve been following your blog, You re AWESOME. Thanks for all your videos, they are really helpful. Love them! I live in Buenos Aires, Argentina. In May/June i might be travelling to NY, and Im asking your advice in order to go to a yoga studio there and take some classes. Any suggestion is totally welcomed!!! The work you are doing on line is TOTALLY GREAT!!! Congrats as you share all your knowledge and kindess all around the world! Adriene, have you considered doing a YTT? I would love to learn from you! I began a new journey that started with you this year. I randomly came upon you and completed first your 30 days of yoga, followed by Revolution. I wake at 6am every day (which has never happened in my life) and join you in my practice room. You have made me laugh and cry…I feel like we are in the room together…and Benji brings me incredible joy when he pops up on the screen. I live in a small town in Ohio but I hope to visit Austin and meet you one day. You are an inspiration and I am grateful for what you have given me. You are a force for good in the Universe. I have suffered from depression and anxiety for all of my adult life. Last year due to additional stressors it became debilitating, many days leaving me bedridden and despondent. I knew that I had to do something different. I made many lifestyle and diet changes, including daily yoga. Your videos are a motivation to get up and do yoga every day. Thank you for helping me to change my life. Any plans of coming to Germany soon? Texas is just soooo far away! Hi Adriene, I started with Yoga with Adriene about 9 months ago and am now addicted. I don’t manage to do it every day but maybe 4 or 5 days a week. I’m 57 and the ache in my shoulders has completely disappeared. I was quite convinced that in time I would need a hip replacement but now that pain has disappeared as well. The sense of wellbeing that I feel after my sessions with you is wonderful. And I also feel more patient and a kindness to others and myself. I am one of those people who push myself to the limit and never happy with my limitations, but when doing yoga with you, I understand that it takes time and I don’t get discouraged. I love your humour and am always laughing with you. Thank you so much for your lovely sessions. I feel the love and so appreciate being able to do them with you. Thank you from New Zealand. Have you ever considered offering teacher training online? You’d make a fantastic instructor and we your students would be grateful 🙂 Thanks for all you do! Today I keep doing your clases – almost – daily together with a 1x/week kundalini class with a yoga group. Please keep on with such an amazing work. Hope to go to Austin someday to attend your live clases. PS Yoga Revolution its th best!!! I just finished Day 15 of your Yoga Revolution program and feel great! Are you planning on coming out with another 30 or 31 day program this summer? Thanks for spreading a lot of positivity and love. You’ve certainly helped me get through tough times. Just wanted to reach out to you to thank you for what you do here. I am a physical therapist in MN and new to Yoga, and wanted to let you know how much your teachings having impacted my practice as a therapist. I am able to adopt the mindfulness, relaxation, and even some of the poses with my patients in pain and have noticed a marked improvement in my results. Movement is powerful. My name is Paul and I teach at an elementary school in southwest Austin. At the end of the year we do an activity for the school so teachers can begin cleaning and clearing out their classrooms. We call it a three-ring circus. I was wondering if you did any programs leading young people in mindfulness/yoga practice? It would be three 45 minute sessions and it is held on June first. I really appreciate your approach to presenting the practice of yoga to us through your videos. There is a small budget available. My friend told me about your youtube channel about a year ago and I was not so into yoga then. But your classes are so easy and happy so I´ve followed you for about a year now and you always make me so happy. Thank you for all the energy and happiness that you bring us in your videos. Your videos have helped me through all the phases this year and you have a video for everything. Thank you for taking your time and making these videos for us! Please take these words to your heart and keep posting videos. Hi Adrienne, I am new to yoga and came across your website when searching for different videos to do at home a couple months ago. I’m a bit of a couch potato and really want to start moving! Your videos are so inspirational and motivating. I am about to get married and go on a 10 week honeymoon in Europe! Yay! And I’m wanting to to take advantage of the time off work, explore not only the wonderful places I’m going to but explore more of myself as well. What downloadable videos from your site would you recommend would be the best when travelling for a beginner? Again LOVE your videos, you make it so enjoyable and easy to want to get on the mat! I love your yoga-videos! I just wanted to text you for a wish. I just went through surgery for breast cancer and I’m wondering if you have any suitable video for post partum workout? It has only been a couple pf week since my surgery so I cannot do any hard workout. First off let me start by saying thank you for your yoga; I love everything about practicing with you, I admire your simplistic surroundings, your fun loving attitude and humor, your nail polish, etc. and I always feel good during and afterwards. Last month I attempted to do 30 days of yoga and did great for a week then started missing days and then about a solid week at the end of the month. This month I started yoga revolution and have done well but now have already missed 3 days. (I’m trying to regulate day and dare) I need help deciding wether to continue from day to day as if I hadn’t missed a day or to skip a workout and continue on as if I had done it. My goal is to get to the point of actually doing yoga daily. Please don’t just say do what feels good. Thank you so much for this community. I’m so grateful for the home practice I can cultivate with your videos and emails! I live in Boston but am traveling to Austin this summer, and I have the chance to take a class at Practice Yoga on Wednesday July 19th. Will you be teaching that day? It would be such an amazing opportunity to take a class with you! I really connect with your style of practice. Whimsy, gentleness and humor are what I hope to bring to my own work. I am a travel nurse in dialysis right now, but I have a dream of a different life someday, one that involves animal rescue on a sustainable farm somewhere beautiful, with my own yoga studio nearby or on the property. Would you be willing to share where or how you trained? I just think you are the coolest person, and your videos have helped me become happier and healthier. I love that you focus on the mental health as well as the physical health. I have been doing the Yoga Revolution and I have noticed such a difference in my body and confidence, so thank you. I love all your yoga tutorials and try to join you every evening. I was wondering if you can recommend one of your tutorials I can re-visit as I am a runner and would like a nice 30 min daily routine that concentrates on calf, quads, glutes and lower back…not forgetting hip flexors. I actually enjoy your cyclist one as it works similar groups but cannot find it for some reason. I really enjoy your YouTube-classes. You are one of the few yoga teachers I can do yoga without looking on the screen. Your guiding voice is mostly enough. In the beginning of october 2017 I’ll be in Texas. A good oportunity to meet you in person at Practice Yoga Austin. (Un)fortunatly,you’ll be on a roadshow. Does it mean you certainly won’t be in Austin the first week in october? I wanted to say that I had been suffering with bad Plantar Fasciitis for a few months. On a whim, I looked up yoga videos and found YOU! In less than one week’s time of working with your videos, my feet are getting better. It doesn’t hurt to walk. I have come to LOVE your videos. I only wish I could make it to one of your classes. Thank you for the fantastic inspiration! Could you do a tutorial on hand stands? I saw your head stand one, but I’d love one on hand stands! Hello! first time on this site and on my 27 day of yoga revolution! I d love to make the 200 hs training in India. By december. Any suggestions!? I have been practising with you online for about 18 months now from Perth in Western Australia. Before this I wasn’t a fan of yoga but finding you has literally been life changing! The freedom to develop a practice at home, to not have to conform to “hitting the shape” and actually finding what feels good has turned yoga upside down for me and I am now trying to embrace yoga and your style in my life both on and off the mat. I am excited to be hitting the states at the end of October (28th) to Mid December(10th) this year and being able to do a class with you and get a cheeky heyo in the flesh would be a huge tick off the ol’ bucket list!!! I am hitting LA, San Fran, New Orleans, Chicago, New York and hopefully squeezing in a little bit of Texas too. I want to tell you that I found your yoga camp on you tube, and it is a timely find, as I am working through accepting myself, and growing a healthier mental foundation. Your videos have provided me with additional tools on this journey to calming my mind, and finding peace with myself. Thank you for what you do. I am a beginner, but my goal is to be able to connect to my authentic energy by being able to do the scorpion pose. It is several years away, but it is the journey that matters. I have been practicing Yoga with Adriene for 6 months now. It has been powerful in my life. Thank You! One and a half years ago I broke my wrist and had surgery, upon rehabilitation I found your site and gently began with 30 days of Yoga. It took me about 40 days to complete, but that got me started. Same injury also gave me a torn rotator cuff (darn that black ice!). Now I practice religiously 2x a day (my morning 20 minutes gets me going and my evening 45+ gives me strength and peace). Yes I have to do poses in a way that “Feels Good” since I have limited range at this point, but knowing that I have to strengthened my back to take over what the torn cuff should be doing adds to my impetus. I look forward to meeting you at the Shrine in October. Peace to you my friend. I would first like to say thank you for all the love and encouragement you pour into your videos! They have helped me grow into the person that I am striving to become! My question is.. Do you ever come to Omaha, Nebraska?? It is close to where I am and it would be a dream come true if you did!! I am planing a visit to Austin and wonder if you will be teaching on Sept 16th or 23rd. Thanks for inspiring me toch start yoga. Ik finished the 30 days course and will go on for 30 days yoga camp. Just bought tickets for your SF show! Super excited! You inspire me every day. I never expected to be laughing out loud during yoga, but that was a happy surprise. I’m just now finding your website and I am absolutely thrilled that I did! I had a baby 10mth ago and have found yoga to be such a wonderful practice for both the mind & body postpartum. I’m excited to see you’ve added Nashville to your roadshow. I am curious the length of each event..
Keep doin’ what you’re doing..you’re inspiring so many. I just wanted to send you some love and say that I am really grateful for all that you do. I starting doing your yoga videos a year ago and now it’s something my brother and I do together. We love your work and thank you for keeping us active, mindful, and helping us to be more present. Your recent ‘Yoga for Depression’ and the ‘Revolution 30 days of Yoga’ are amazing and helped me get through a rough week. So I just wanted to say thank you and that you make a positive difference in the universe. If you are ever in the Boston area please let us know we would love to take a class! You should add Tulsa or OKC to your Roadshow 2017! Your effortless, happy, nononsense and highly qualitative way of teaching yoga made me a FWFG addict about 2 years ago. Next week I will visit NYC for the first time and I would like, if possible, to take a nice class in the city. What class/studio would you advice, since I missed the roadshow opportunity. Hi Adrienne! I just wanted to say these yoga videos are amazing I wake up every morning to see that my dad is doing it! And he has inspired me to do it too. These are wonderful videos you are coming up with and beautiful scenarios in the background. Keep up the good work! Please respond! Hi i wanted to start a 30 day challenge and I already did 30 days of yoga but I was wondering what the differences were between Revolution & Yoga Camp? I am a yoga teacher in Ontario, Canada. You have inspired my practice beyond words. You are literally my favourite person in the world actually. My husband and friends roll their eyes because I talk about you like you are my friend: ” Adriene said this today….”. Do you ever make your way to Canada? A goal of mine is to travel to you and do a workshop or training, but I have a 2 year old and an 8 week old so it’s difficult. Do you ever attend the Toronto Yoga Conference or do any other events my way? Thank you Adrienne for your amazing Yoga videos. I’ve been doing your yoga sessions for a year now and never get bored of them! Just done your Cosy yoga session… felt so good this is really helping me coping with my Dad’s illness and everyday little worries! Thank you for sharing your joy. I just wanted to thank you for all that you do. Following along with your videos has helped me in so many ways and I truly love yoga now. Are you planning to visit the UK in 2018??? Will you ever do an online Yoga Teacher Training? I just love your style and so much about you resonates with me! You are the reason I now love yoga and it’s helped me restore my health in more ways than one! thank you for your amazing videos, they are the only thing I have been able to stick to in home setting for longer than a week. I was wondering if you are planning any Europe tour of workshops/classes/camps any time soon? I’d love to attend your classes and meet you in person but unfortunately I’m over the ocean in Berlin, Germany. Hello! I absolutely love your yoga series! Thank you for everything! Hi! Are the classes at the Blanton art museum ever going to be happening again? They were so great! I’m a huge fan of your videos, and your style of teaching. Right now I’m looking at different yoga teacher training alternatives, and I was wondering wether you are planning to hold one in the upcoming years. I’m planning to do my training in about two and a half year. All the best, continue your great work! Hi Adrienne! I just wanted to say these yoga videos are amazing! Thanks! Adriene, your practice has changed my life! I have been doing yoga for nearly 2 years and are so grateful for what you are doing!! Just wanted to say thanks and look forward to one of your workshop’s or retreat’s someday. My wife and I would love t meet you… keep up the great work!! Hello and Thank You!!! You and your videos are amazing. I am cycling through the 30-day FWFG again and each time am amazed at how the day’s video is exactly what I need. I live in Mexico City – will you be doing any live events while you are here? I’m sure you’ve been asked before but do you have any plans to do a little something in the UK? Can I still get on the waitlist for the Santa Cruz session? I just want to say thank you. I’ve been practicing yoga for about 2 yrs but recently my favourite teacher moved to San Francisco. I was starting to lose my motivation but finding your videos has brought me back to the mat most days. I have just completed the 30 days of yoga pratice, although it took me 38days I got there. Today I’m going to join your yoga for surfers as I would love to learn to surf on my vacation so this feels like perfect the motivation. I’m going to be in Austin in April of 2019, when will you have your schedule available for any events you have going on in Austin in April? I’d love to be able to attend a live workout with you. Hi Adrienne!! Will you ever be coming to Miami, Florida? Would love to be taught by you!!! Dear Adrienne, Your videos have changed my life in only thr first 26 days. Come to the PACIFIC NORTHWEST ??? Santa Cruz is just too expensive for a lot of us. And I personally would rather support you in your sharing with all of us. Much love and gratitude to you from myself and my daughter we both love our practice with you! In Eureka CA the Humboldt Patient Resource Center could host a small event? My name is Brian. In the past I have started, and quit, the 30 day yoga challenge on youtube on several different occasions. I am a 51 year old who recently had a delightful bout of Rhabdomyolytis(SP) that landed me in the hospital for 8 days followed by 45 days of medically restricted activity… you would think that would be cool to HAVE to lay around but for me not so much…Stir Crazy…. I am now on day 4(Im 5 days in but took a day to refresh) which is the back day video and am focused on accomplishing my goal of completing the 30 day challenge and then see where this crazy yoga thing takes me from there. My next goal would be the 30 day challenge you have on your website but hey, lets not get crazy… one step at a time sister. I just wanted to say thank you. Thank you for making your videos, posting them for all to see and for making comments throughout the videos that keep people, like me, motivated. You classes are helping to rebuild my strength and my positive outlook as well. You are such an inspiration! I practise yoga with you almost every day and it makes me feel good, happy, positive and alive. Thank you for you wonderful energy! Lots of love from the Netherlands! I would like to thank You for those amazing humble classes you have shared with us. I have just finished my day 30 and I’m feeling great and really looking forward to starting more 30 days. I have been wondering if you are currently doing a teaching training? I would love to come and learn more form you. I love your teaching style, I love your energy, and I love your sense of humor! You are just adorable!! If you have a teacher training I would love to hear more about it! Love my yoga every morning! I will meet you come to Hamburg. Please come to Boston!!! Sending much gratitude and love for all that you do. Dear Adriene, will there be more dates on your Roadshow 2018 in Europe? I follow you on YouTube since November 2014 and I’m a big fan. It is a big dream of me to meet you soon. What a super small super connected world we live in! I reside in Washington DC and am visiting Amsterdam for the weekend. Just had lunch with a friend who moved here recently at a food hall and we saw lots of people with yoga mats heading into a studio. She asked if I did yoga and I proceeded to tell her of this great you tube yoga teacher and the True 30 day course I did last month. I was even inspired to buy a travel mat which I’ve used a couple of times on this trip already. We glance inside and THERE IS YOUR PHOTO!! Glad to see both classes today were sold out, wish I had known earlier but such a crazy coincidence (?). Enjoy the European tour!! I’ve been doing your yoga videos for some time now and I’m coming to Austin Oct 26-28. I was trying to see if you’re offering any classes then. Would absolutely love to take your class in person! Hi Adriene! I am looking to do a retreat of some sort that will restore my energy and soul. Are there any great places that you would recommend? I want to go around Dec 26th. It can be anywhere in the US. Want it to include nature, meditation, yoga, hiking and peacefulness. HI Adrienne: I love YWA. I have been following you for over a year and if I don’t see your face and hear your voice each day I feel lost. You have inspired me physically, emotionally, and spiritually. Do you ever come to CANADA… we are not all about snow and your Canadian followers would love if you came to visit. I live in the Toronto area. it would be so wonderful to meet you and practice yoga with you in a studio setting…..
Where can I buy the tickets to the even 1/20? Tyler, the tickets are available 30 days before the event. Check back to this page on 12/20/18 for the link for the tickets for the 1/20/19 class. Any ideas when the link for tickets will be available today? Im so excited because I am making a trip to Austin from Vermont! Hi Ajah, the link to get your tickets for the January class is live now. It is in the article above. Enjoy your trip! How do I go about signing up for the yoga event at Fair Market on January 20th? Happy new year, Adriene & company! I would like to send some encouragement and thankfulness in your direction. 2018 was a big year for me getting proper habits back into my life. When I decided to make yoga a part of my daily routine, I stumbled upon the original 30-day challenge from 2015 and got through it by about mid-December. So thanks for helping me through a truly transformative year in my life! I have decided to make a pilgrimage down to Austin for the Fair Market event in February, looking forward to it immensely. Good morning, Adriene, and Happy New Year! I found your yoga videos during the summer (2018) and LOVE them! I have C1, C2, and C3 bulging disks and was told NO YOGA by a chiropractor. Well,I refused to NOT do yoga or stay fit. So, not being new to yoga, I selected the best videos to protect my neck, modified some poses during your practices, used my inner core more than ever, and started to meditate more during the practices. My pain level has decreased by more than double and I feel better and stronger. Thank you! I’m excited about starting the 3-day journey you posted at the New Year. I have a request – would you consider making a video for teen athlete BOYS? My son’s football coach suggested he start a regular yoga practice to increase his flexibility as a kicker/punter and a soccer player. I see you have done specific videos for surfers, runners, skaters….thanks and Namaste! Hi Jessica, I’ll pass your request on for teen athlete boys 🙂 It’s great to hear how well you are doing with your practice! First, I want to thank you for everything. You are my dream teacher really. I have been practicing Yoga for several years but never found a teacher that would carry what is for me the true spirit of Yoga, which is miles away from what I have been experiencing in too many courses. With you, I can connect not only to my true self and feel free from any judgement (including mine), and to the core of the Yoga spirit, the deep foundation, what is in the mind and spirit. So thank you for your generosity and authenticity. I have been following and your yoga classes for a while and from different places all over the world (China, Philippines, Belgium). I am in Austin right now until February 15. Is there a chance I can do a ‘life’ class with you? That would be wonderful! Thanks! Well the world going crazy. Hi Adriene. I am a follower of your free yoga videos on YouTube and I am so grateful for this service that you provide. I am in Austin for MY SON”S WEDDING(!) and SXSW from March 13-17 and had hoped to connect to an in-person class with you. However it looks like I am missing you by a few days, what a shame. Anyway, thanks, and let me know if you have anything on those days. Good afternoon and happy Wednesday! I have a similar question as many others on this forum… My bachelorette party is happening July 25-28 in Austin, and many of us ladies are big Adriene fans!! We planned to check out Practice Yoga Austin, but wondered if it would be possible to set up a yoga sesh with Adriene for the gals?! How cool of an experience would that be?! Hi Katy! 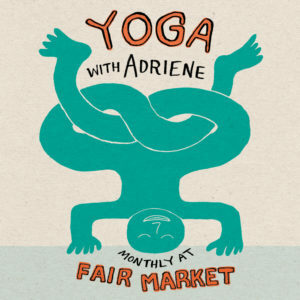 Unfortunately Adriene is not able to do private events but keep an eye on this Events page in case there is a community class at Fair Market during the time when you and your friends are in Austin. Best wishes! I’ve been watching Adriene for over a year and truly feel like she is one of my friends. I can’t express how much peace and joy she’s brought into my daily life! I’m looking to visit Austin this summer and I’d love to visit a class with Adriene. I know you post when the events are here, but I’m wondering if it’s possible to know the summer dates to plan ahead? Thanks so much for everything and teaching me to find what feels good! I am bringing my niece to Austin for a long weekend in August or September for a pre wedding gift. Her only request is that we do yoga with Adrine while I’n Austin. When should we schedule or trip, how do we make a reservation? Thank you very much. Valarie, the Aug class will be Aug. 25th. There isn’t one set for September at this moment. I hope you and your niece will be able to come!